A Conceptual Framework in B2C e-commerce: Customer Expectations and Satisfaction Relation With Online Purchasing Behavior. The Internet has become an essential business platform for trading and selling products. Online customer expectations grow every day, so companies are forced to adopt a more planned approach towards e-commerce. Marketers have to know what their customers expect and how best to deliver satisfaction so they can predict online purchasing behavior. Zeinab Eshaghi, Ali TaeiZadeh. "A Conceptual Framework in B2C e-commerce: Customer Expectations and Satisfaction Relation With Online Purchasing Behavior." 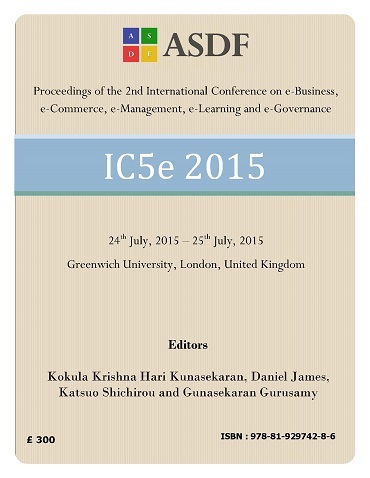 International Conference on eBusiness, eCommerce, eManagement, eLearning and eGovernance (2015): 93-98. Print.